The theme for Project Sewn this week was If the Shoe Fits, creating an outfit inspired by a favorite pair of shoes. I already had this one done. I have a serious love of shoes. It all goes back to high school and my very first job, in a shoe store. Too bad I didn’t hang on to some of my past favorites. 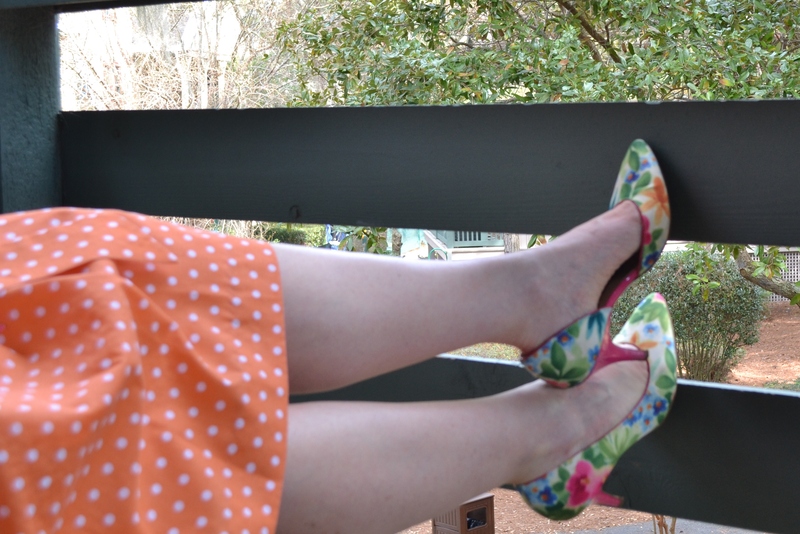 My current favorite pair of shoes are my flowered fabric pumps, with the hot pink heels. I find flowered shoes hard to resist, and I love wearing this pair. 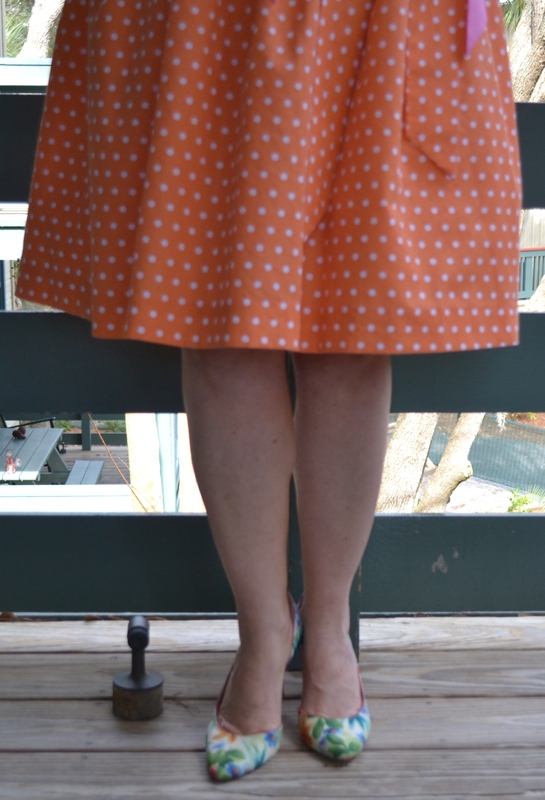 I also have a thing for polka dots and was trying to find a pink fabric when I came across the orange cotton. The skirt is just a simple, gathered basic dirndl with a waist band. No patterned required, just two rectangles, pockets, zipper and waist band. I did a lining in white to make sure it wasn’t too sheer. This style of skirt was one of the first things my mother taught me to make. We used to call them broomstick skirts and you were supposed to wrap them, wet, around a broomstick to create pleats, but we always skipped that part. Did I mention I love the shoes. They’re happy shoes. Maybe a little too colorful for Michigan right now, but the colors are a little brighter in the South Carolina sunshine. By the time this is posted, I’ll be back in snowy Michigan, remembering the few warm days of vacation and looking forward to spring so I can wear my floral pumps again. Oh I love those shoes. The outfit is great, but gimme the shoes. Thanks, these are happy shoes. What a great outfit! 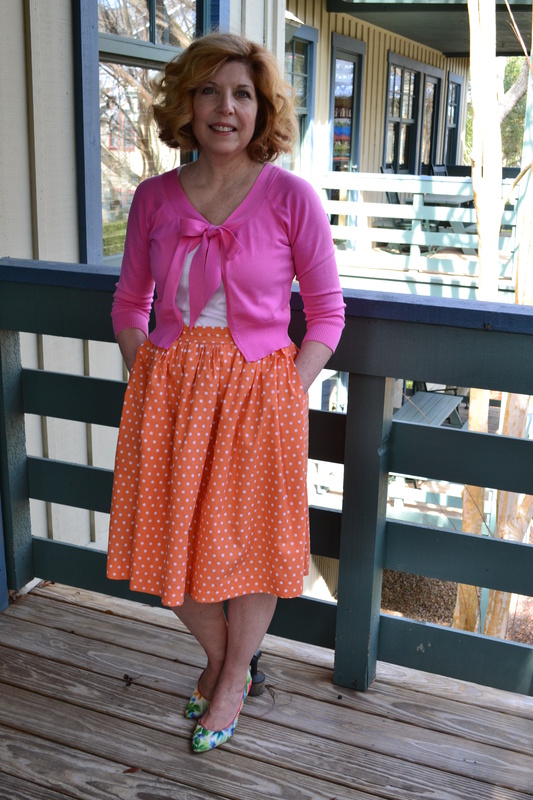 I love the bright, cheery colors of the skirt and cardigan. And the shoes really are too die for. Thanks, we all need some cheery colors after this long hard winter. Thanks, the sunshine and warmth of South Carolina has revitalized us. Gorgeous shoes and skirt….and the cardi! Did you make the cardigan too? I love shoes and bows! Thanks, I just did the skirt and tank, the cardigan is a few years old. 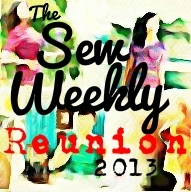 I’d love to try to sew some sweater knits. Cardigans are the only thing I miss buying while doing the Ready-to-Wear Fast. I love cardigans too! My comfy dress code is dress and cardi! So fun and bright! You look ready for spring. Thanks, I’m more than ready for spring. Go away old man winter. Hello spring skirts and dresses. 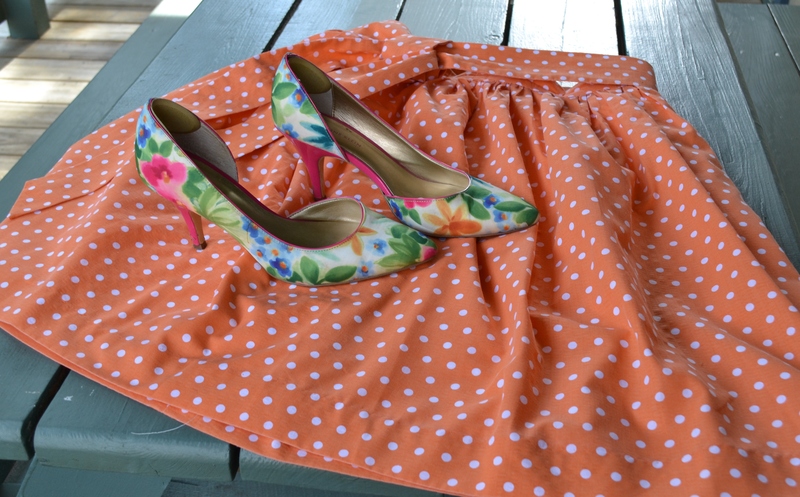 Serious shoe envy, love the orange polka dot skirt and the way you have styled this outfit! Thanks so much. It’s fun to wear some warm weather colors for a change. Oh! These are such pretty shoes! And the polka dot skirt!!! So cute! Love the sweater too! Thank you. It’s hard to put it away and go back to wearing snow clothes. So bright and cheery and a good shot of hope for those of us stuck in the snow! Thank you, a week in the warm weather and sunshine was wonderful, but so hard to go back to the cold and snow. Hurry Spring!